This page refers to the first Magik, Illyana Rasputin. For the second Magik, see Amanda Sefton. Textless cover of X-Men: Return of Magik #1 (November 2008). Art by Olivier Coipel and Mark Morales. Magik (Illyana Nikolievna Rasputina) (Russian: Ульяна Николаевна Распутина) is a fictional superheroine appearing in American comic books published by Marvel Comics, most often in relation to the X-Men. She first appeared in the comic book Giant-Size X-Men #1 (May 1975). Magik is the younger sister of the Russian X-Men member Colossus. She is a member of a fictional sub-species of humanity known as mutants, who are born with superhuman abilities. Her natural mutant power is the ability to teleport. She also is a capable sorceress. Anya Taylor-Joy will portray Illyana Rasputin in the upcoming film The New Mutants. Illyana first appeared in Giant-Size X-Men #1 (May 1975), though her first name was not given until The Uncanny X-Men #145 (May 1981). For the first eight years of the character's existence, she was an infrequently appearing background character. The means of changing this was set in The Uncanny X-Men #160 (August 1982), in which she ages seven years while in a paranormal dimension called Limbo, becomes a sorceress, and develops the mutant ability to create "teleportation discs." These changes were not immediately explored or explained, and for the next year she remained essentially a background character. In December 1983, the limited series Magik (Illyana and Storm) was launched, chronicling Illyana's years in Limbo. Immediately following the end of the series, she was added to the cast of the New Mutants, appearing regularly in that comic until The New Mutants #77 (July 1989), in which she returns to her family in Russia after having reverted to childhood. As the younger sister of Colossus and a member of the New Mutants, she also sporadically appeared as a guest star in Uncanny X-Men. In Uncanny X-Men #303 (1993), she dies of the Legacy Virus. Other than flashbacks and alternate realities, she was absent from regular publication for most of the 1990s, though she does appear as a time-traveler in New Mutants: Truth or Death #1-3 (1997). After being resurrected by Belasco, she returned to regular publication in 2007, in New X-Men #38-41 (2007), X-Infernus #1-4 (2009), X-Men: Hellbound #1-3 (2010) and New Mutants (vol. 3) #1-29 (2009-2011). As a member of Cyclops' Extinction Team, she appears in Uncanny X-Men (vol. 2) #1-20 (2012), Avengers vs. X-Men #1-12 (2012), AVX: Versus #3 (2012), and AVX: Consequences #1-5 (2012). She appears in All-New X-Men, Uncanny X-Men (vol. 3), Extraordinary X-Men and New Mutants: Dead Souls (2018) as a regular character. Illyana Rasputin (born Illyana Nikolievna Rasputina) was born in the Ust-Ordynski Collective farm, near Lake Baikal, Siberia, Russian SFSR, Soviet Union to Nikolai Rasputin and his wife Alexandra Natalya Rasputina. Illyana's two older brothers, Mikhail Nikolaievitch Rasputin and Colossus (Piotr "Peter" Nikolaievitch Rasputin) are also mutants. Colossus' superhuman powers manifest while saving Illyana from a runaway tractor. Shortly thereafter, Illyana is called to the Limbo dimension by Belasco, who seeks to bring forth the Elder Gods to rule Earth. She is raised there, frequently bullied and tormented by Belasco's underling S'ym. In order to free himself, Belasco needs to fill the Beatrix Medallion with five bloodstones. The bloodstones are created by corrupting Illyana's soul, with a new stone appearing as her corruption deepens. She is rescued and tutored in the practice of white magic by that dimension's version of Storm (who turned to magic when her mutant powers waned). Finding the use of magic abhorrent, Limbo's version of Shadowcat, known as Cat, kidnaps and trains Illyana in hand to hand and sword combat. Cat, along with Illyana, storms Belasco's citadel. They are overwhelmed by Belasco who further transforms Cat into a feline demonic creature. With Illyana back under his control, Belasco instructs her in the art of black magic in the hopes that it will further corrupt her soul. However, Illyana plots Belasco's defeat and continues to resist the dark influence on her soul. Illyana forms a mystical bond between both Storm and Cat, who were also tutored by Belasco. Belasco succeeds in creating three parts of Illyana's bloodstone pendant. Illyana creates the Soulsword and takes over Limbo as its new ruler. While wielding the Soulsword she manifests horns, a tail and fangs. She banishes Belasco from Limbo and claims S'ym as her servant. She then returns to Earth a decade older, although no time has passed on Earth since her kidnapping. She subsequently joins the New Mutants. 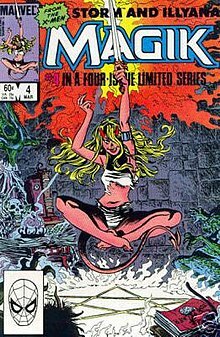 Magik misguides one of her teleportation discs through the space-time continuum and strands herself and Mirage in ancient Egypt. There, Illyana meets Storm's ancestor Ashake, an Egyptian priestess. Together, they defeat an evil sorcerer, Heka-Nut, who sought an ancient mystical sword called the Sword of Bone using Magik's Soulsword. Ashake helps Illyana and Mirage return to the present, with Mirage's memory of the incident erased in the process. A strange armor begins to appear on her body each time she wields the Soulsword. The armor appears only on one of her shoulders and arms at first, but appears on more of her body each time that she wields the sword. Illyana's skill as a sorceress grows, and she battles other beings with mystical powers such as Baba Yaga, the Enchantress, Forge, Spiral, and Heka-Nut. A routine trip through Limbo goes awry, leaving the New Mutants stuck in Limbo. To open an escape route for her teammates, Illyana embraces her demonic nature and opens a colossal teleportation disc between Earth and Limbo, which N'astirh holds open, triggering an invasion of Earth by demons from Limbo. Ashamed of herself, she flees into Limbo, and decides to end the demonic invasion by assuming rule of Limbo. However, her teammate Rahne Sinclair persuades her against this, and she instead gives up her demonic powers by creating a massive stepping disc that banishes the demons back to Limbo, then throws her Soulsword in after them to seal the portal shut. Afterwards, the New Mutants find a seven-year-old Illyana inside the husk of her eldritch armor. She still possesses the bloodstone locket. Because of the mystic bond she shares with the Shadowcat from the Limbo dimension, the Soulsword passes on to Earth's Shadowcat in England. It embeds itself in a stone near Excalibur's lighthouse headquarters, waiting for Shadowcat to claim it and become its new wielder. After a conflict with the necromancer Gravemoss, the Soulsword is acquired by Amanda Sefton, who would claim Illyana's mantle as Magik, ruler of Limbo and wielder of the Soulsword. Illyana returns to Russia where she lives with her parents for some months until they are murdered by the Russian government in order to secure Illyana's abilities to defeat a psionic being known as the Soul Skinner. Illyana then returns to the X-Mansion to live with her brother and the other X-Men. Illyana's spirit returns to Colossus, who had recently returned to the United States with Shadowcat and Nightcrawler following the disbanding of Excalibur. When investigating odd occurrences inside the Mansion, Colossus locates one of the stepping disks that Illyana had magically bound to the school. He is transported to a pocket world, which holds a memory imprint of Illyana. [volume & issue needed] Illyana's memory convinces him to make one final sacrifice. When the cure for the Legacy Virus turned out to need the death of one mutant, he secretly gave his life, so nobody else would have to die like Illyana did. [volume & issue needed] Colossus is later resurrected by an alien race. Belasco eventually deposes Amanda Sefton and, after seeing Illyana reappear during the 2005 "House of M" and realizing he carries a torch for her, creates a powerful spell to return her to him. The spell pulls forth the remaining essence of Illyana still held within Limbo's dimension, taking shape as the Darkchilde, the semi-demonic version of Illyana corrupted and transformed by dark magic. Belasco is not satisfied with his creation, claiming that it is not the true Illyana Rasputin (due to her lack of Illyana's soul) and banishes her to the outer parts of Limbo. Illyana, now with her Darkchilde persona, discovers some of the teenage New X-Men being attacked by a horde of demons. After aiding the mutants against the demons, she uses a spell to immobilize them and steal a portion of Pixie's soul, in the hopes of creating both a bloodstone and a new Soulsword, as Illyana felt Pixie had the most innocent of souls present. Anole breaks free from Illyana's confinement and dispatches her. Pixie's soul extraction is partially successful however, creating one part of a bloodstone pendant and a soul dagger. Illyana attempts to complete the process and destroy those who wished to interfere, but Rockslide thwarts her, and causes Illyana's human memories of her friends and life among the X-Men to return to her. Although only a part of Pixie's soul was taken, Pixie is now capable of performing magic, the hole in her soul having been filled with black magic. Since Belasco had sealed his castle from her own magic and powers, Illyana teaches Pixie a teleportation spell, with which the New X-Men attack and defeat Belasco. Illyana succumbs to her Darkchilde persona and announces her desire to create several more bloodstones in order to become god-like in power. She is interrupted by the arrival of Colossus, investigating Illyana's apparent return to life. A pained Illyana rejects her brother's offers of help, and sends everyone back to Earth, before reclaiming Limbo's throne and informing S'ym and N'astirh, now once more her servants, that her next move is to reclaim her soul. Motivated by her friendship with Shadowcat and love for Colossus, Illyana tries to reclaim her soul through love and teleports to the Xavier Institute, only to find it destroyed and abandoned. Cover art for X-Infernus #1. Magik as Darkchilde. Art by David Finch. While in Limbo, Illyana attacks various demons in her search for the Bloodstone amulet. Her activities are noticed by Mephisto, Blackheart, Satannish, Dormammu and Hela. Belasco's daughter, Witchfire appears during the meeting and reveals she is the current owner of Illyana's Bloodstone amulet and vows to take her father's place as ruler of Limbo. Back at the X-Men's base in San Francisco, Pixie accidentally discovers Magik's Soulsword is hidden inside Nightcrawler. Sensing its presence, Illyana teleports in and reclaims her sword, transforming from the Darkchilde into her Magik persona. She strikes Colossus when he enters the Danger Room and calls out to her, realizing that something is wrong when she does not feel any emotions, and returns to Limbo. Witchfire has conquered Limbo and Magik's armies during her absence. Claiming everything that Belasco ever owned, Witchfire captures Magik, takes her bloodstone and adds it to the amulet. The X-Men arrive at the castle; Nightcrawler finds Illyana chained to a pillar. At her direction, he stabs her with Pixie's soul dagger, re-releasing the Soulsword inside of her. Witchfire completes the set of Bloodstones via another portion of Pixie's soul and releases the Elder Gods. Illyana and the other mutants hold back Witchfire and the Elder Gods. Using a combination of magic and the powers of the Soulsword and Souldagger, Illyana and Pixie remove one of Pixie's bloodstones. The Elder Gods are swept back to their dimension, along with Witchfire and the remaining bloodstones. Pixie's Souldagger merges with the bloodstone that was pried loose by Ilyana. Saddened by the loss of her and Pixie's remaining bloodstones, Illyana teleports the mutants back to the X-Base, and they convince her to stay with them. Later, Cyclops sends Illyana to team up (unknowingly) with X-Force to locate Wolverine and teleport them to Alcatraz to rescue any mutants taken prisoner by Norman Osborn's forces. Along with Pixie, they teleport all the X-Men from San Francisco to their new home, Utopia. When Hope Summers and Cable return to the present during the 2010 "X-Men: Second Coming" storyline, Bastion begins eliminating all mutant teleporters to trap the mutant population on Utopia. While trying to bring Hope and Cable to Utopia, Illyana is fired upon by one of the Purifiers with a supernatural weapon that opens a portal to Limbo that she cannot control; she is drawn into the portal by a cluster of demonic tentacles. She is eventually freed from her restraints by Pixie, and Illyana and her rescue team return to Earth. In a reversal of fortune, Pixie is kidnapped by Project Purgatory, and Magik returns to Limbo with the New Mutants in order to rescue her. While in Limbo, the New Mutants encounter the Inferno Babies - mutants who were taken as infants by the government and raised and trained in Limbo. This now-adult team attacks and overwhelms the New Mutants. While the rest of the team is captured, Magik escapes to Earth with Karma and Pixie. After hiding the Soulsword inside Karma, Magik teleports the rest of the X-Men to Portal Epsilon, Project Purgatory's gateway to Limbo, for what the X-Men believe to be a rescue mission. They arrive just as Limbo's Elder Gods breach the gateway to Earth. Karma releases Legion's mind with the soulsword, freeing him to use his powers to destroy the Elder Gods and return the bloodstones belonging to Magik and Pixie, thus restoring their souls. Confronted by Cyclops afterward, Magik admits to putting the world in danger and manipulating the X-Men for the sake of a personal vendetta against the Elder Gods. Cyclops decides that she must be restrained. While she remains unrepentant, she accepts his decision. Following the events of Schism, Magik is selected to be a member of Cyclops' "Extinction Team." Despite this status, she remains a prisoner. She is only released from the X-Brig for missions, and while in the field, her suit contains lethal fail-safes that prevent her escape. Illyana is chosen as one of the "Phoenix Five," a group of X-Men granted additional powers by the Phoenix Force. After Ms. Marvel is defeated by Rogue, Magik appears and gags the Avenger before teleporting her into Limbo, trapping her and terrifying Rogue. Following the defeat of Cyclops, Magik and the other former members of the Phoenix Five are reported to have fled. Magik joins Cyclops' team of X-Men at the New Xavier School at the old Weapon X facility. The Phoenix apparently has damaged Magik's powers, like it apparently did to the other five; Illyana initially thinks her ability to channel increased energies from Limbo is a power upgrade, but Dormmamu pulls her into Limbo, and demonstrates that her newfound ability to effortlessly summon Limbo energies is destroying Limbo. Dormmamu later pulls the entire Uncanny team into Limbo, intending to kill them in front of Magik before he kills her. They fight back and Illyana absorbs all of Limbo's mystic energy, causing it and its creatures to disappear. She sends the X-Men back to Earth, and travels back through time to become the protégé of a past version of Dr. Strange, explaining that she needs a greater understanding of magic, so as to better control her mutant powers. She later helps Dr. Strange defeat the Empirikul, a science cult focused on destroying magic in every dimension. Magik is employed by Karma to lead a new New Mutants team along with Wolfsbane, Rictor, Strong Guy, Prodigy and Boom-Boom. After Illyana absorbed all of Limbo, the stepping discs ceased to exist; now when Illyana teleports, hellish images of ghosts, dragons, or other supernatural creatures appear. On Earth her magic was limited to astral projection, sensing mystical presences, scrying, and casting very simple spells. In X-Infernus, she uses magic of a seemingly greater strength than she could previously use in Earth's dimension. Since absorbing Limbo and becoming Dr. Strange's disciple Illyana's magic on Earth has been considerably stronger, such as when she used spells she learned from Dr. Strange to destroy advanced Sentinels. The more that Magik uses her magical power, the more mystical armor appears on her body in addition to demonic features such as horns and hooves. The armor deflects or limits attacks, both physical and magical. Illyana's armor also provides protection from the Transmode Virus. The armor also provides Illyana with super-strength, which she displayed by being able to toss the giant demon S'ym off of her several feet. Magik's Soulsword disrupts magical energies, constructs, and creatures. It also augments the power level of any magic user who holds it. The Soulsword generally has no physical effect, but disrupts even the most powerful magic as it passes through. Since Illyana's resurrection, the Soulsword seems to affect psychic beings like Legion's personalities, whereas in the past the sword only affected magical creatures and spells. The only exception to this has been Kitty Pryde, who can still be cut by the Soulsword even when Pryde is using her phasing power to become intangible. Illyana can make her Soulsword appear and vanish at will. After Avengers vs. X-Men, Illyana has used her Soulsword against physical beings, including a Sentinel. Illyana has formidable psionic shields, which block anyone from reading her mind, even such powerful telepaths as Professor X, the Shadow King, and Rachel Summers. Since her revival, Illyana is able to lower her psionic shields. 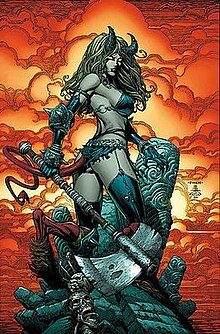 In the Age of Apocalypse timeline, after Apocalypse's attacks on Russia, she is taken to the slave camp known as the Core located in Seattle, which provides energy for Apocalypse's empire. Colossus, Shadowcat and Generation NeXt rescue her, at the cost of the lives of every single member of Generation NeXt. Illyana then helps Bishop go back in time to prevent the Age of Apocalypse from occurring in the mainstream Earth-616 timeline. In the 2000 Blink limited series, it is revealed via flashback that Sugar Man was at one point the abusive jailer in charge of cellmates Illyana Rasputin and Blink (before she was rescued as a young girl by Weapon-X and Sabretooth) in a prison facility. During Excalibur's "Cross-Time Caper" storyline, the team encounters a childlike version of Illyana, clothed in the regalia of Dr. Strange, who runs an organized crime cartel in partnership with her friend Shadowcat. When Alistaire Stuart and a near comatose Rachel Summers are threatened by the authorities, Illyana grants them sanctuary; however, she merely intends to use her guests in a bid for dominance over the world. When the authorities once more attempt to search Illyana's apartment, an altercation occurs and she is shot dead but merely resurrects into her fully demonic form. That world's Captain Britain and Psylocke arrive on the scene to help stop Illyana. Psylocke psychically restores Phoenix, who performs an exorcism on Illyana and restores her to her human state. Not a true alternate earth as such, House of M is a temporary recreation of Earth-616 by the Scarlet Witch in which mutants are dominant on Earth. Magik is a member of a S.H.I.E.L.D. squadron of young mutants called the Hellions. Like most of the other Hellions, she eventually joins the side of the New Mutants, a team being groomed as future leaders, in fighting the establishment of the House of M in Japan. This version of Magik teleports to Limbo before the Scarlet Witch restores reality to its former state. This results in Belasco's resurrection of Illyana in Earth-616. In this reality, she can speak Japanese. In the Shattershot crossover, a reality was shown in which Illyana was regressed in the same way as in Earth-616 but never succumbs to the Legacy Virus. She grows up to master her mutant and mystical powers, calls herself Darkchild and joins X-Force alongside Sunspot and Cannonball. In another reality in which Illyana is an adult, her son is trapped in an incorporeal form. She makes a deal with Mephisto to provide him with a body, at the cost of all mutants' lives, but her son ultimately rejects the offer. In "What If? the X-Men Had Stayed In Asgard?" Illyana is one of the New Mutants who chooses to remain in the Realm Eternal. She eventually replaces the Enchantress as Asgard's supreme sorceress and assumes a secondary role as liaison between her teammate Danielle Moonstar, the new ruler of Hel, and Asgard. Anya Taylor-Joy was cast to portray Illyana Rasputin / Magik in The New Mutants, written and directed by Josh Boone. Illyana Rasputin made non-voiced appearances in the X-Men animated television series. In the episode "Red Dawn" (1993), she remained by as Colossus and the X-Men fight Omega Red. Illyana was also seen in the episode "Time Fugitives" (1993) in one of Cable's altered time-stream visions among the many mutants who experience harmful mutations which would eventually kill them as they're without the antibodies developed to fight Apocalypse's techno-organic virus. Illyana Rasputin is mentioned in X-Men: Evolution. She's a hostage, thus why Colossus is in Magneto's employment. At Comic Con 2009, Magik was one of several character design sketches shown for Wolverine and the X-Men. Illyana Rasputin appears as a non-playable character in the video game X-Men Legends, voiced by Jeannie Elias. She is psychically kidnapped by the Shadow King in order to lure Professor X onto the astral plane. Magik appears as an unlockable character in the Facebook game Marvel: Avengers Alliance. Magik appears as a playable character, NPC and Team-up in the MMO Marvel Heroes, voiced by Tara Strong. Magik appears as a playable character in Marvel Contest of Champions. Magik appears as playable character in Marvel Future Fight. ^ Claremont, Chris (w). Uncanny X-Men #145-147. Marvel Comics. ^ a b Claremont, Chris (w). Uncanny X-Men #160. Marvel Comics. ^ Simonson, Louise (w). New Mutants #71. Marvel Comics. ^ Magik #1. Marvel Comics. ^ Magik #2. Marvel Comics. ^ Magik #3. Marvel Comics. ^ Magik limited series, and Uncanny X-Men Annual #9 (1985). Marvel Comics. ^ a b Magik #4. Marvel Comics. ^ New Mutants #32. Marvel Comics. ^ a b c d Mystic Arcanna #1. Marvel Comics. ^ New Mutants #18-20. Marvel Comics. ^ a b New Mutants #66. Marvel Comics. ^ Simonson, Louise (w). New Mutants #70-71. Marvel Comics. ^ a b Simonson, Louise (w). New Mutants #73. Marvel Comics. ^ X-Men: Magik #1 (2000). Marvel Comics. ^ X-Men (vol. 2) #17-18. Marvel Comics. ^ Uncanny X-Men #303. Marvel Comics. ^ Uncanny X-Men #365. Marvel Comics. ^ Astonishing X-Men #5 (2004). Marvel Comics. ^ a b c New X-Men #41. Marvel Comics. ^ New X-Men #40. Marvel Comics. ^ X-Men: Divided We Stand #2 (2008). Marvel Comics. ^ X-Infernus #1. Marvel Comics. ^ a b X-Infernus #2. Marvel Comics. ^ X-Infernus #4. Marvel Comics. ^ New Mutants (Vol. 3) #1. Marvel Comics. ^ Dark Avengers #8. Marvel Comics. ^ New Mutants (Vol. 3) #12. Marvel Comics. ^ X-Men Second Coming - Revelations: Hellbound #3. Marvel Comics. ^ New Mutants (Vol. 3) #17. Marvel Comics. ^ New Mutants (Vol. 3) #18. Marvel Comics. ^ New Mutants (Vol. 3) #20. Marvel Comics. ^ New Mutants (Vol. 3) #21. Marvel Comics. ^ New Mutants Vol. 3 #25. Marvel Comics. ^ Uncanny X-Men #540. Marvel Comics. ^ Uncanny X-Men (Vol 2.) #1. Marvel Comics. ^ Uncanny X-Men (Vol. 2) #9. Marvel Comics. ^ Avengers Vs. X-Men #6. Marvel Comics. ^ X-Men Legacy #269. Marvel Comics. ^ Uncanny X-Men (Vol. 2)#1-3. Marvel Comics. ^ Uncanny X-Men (Vol. 3) #1-2. Marvel Comics. ^ Uncanny X-Men (Vol. 3) #5. Marvel Comics. ^ Uncanny X-Men (Vol. 3) #7. Marvel Comics. ^ Uncanny X-Men (Vol. 3) #22. Marvel Comics. ^ Dr. Strange: Last Days of Magic #1. Marvel Comics. ^ New Mutants: Dead Souls #1. Marvel Comics. ^ Kit, Borys (June 2, 2017). "Fox's 'New Mutants' Casts Newcomer Blu Hunt in Danielle Moonstar Role (Exclusive)". The Hollywood Reporter. Retrieved June 2, 2017. ^ "San Diego Comic-Con 2009: Marvel Gets Animated And Some Anime Too - Toon Zone News". toonzone.net. Retrieved 18 March 2018. ^ "The full scoop on Marvel Heroes' team-ups". joystiq.com. Retrieved 18 March 2018. ^ "Tara Strong Voices Magik in Marvel Heroes 2015". YouTube. November 25, 2015. Retrieved December 10, 2015. ^ Chabala, Ben (January 21, 2015). "Entering Marvel Contest of Champions: Magik". Marvel.com. Archived from the original on January 25, 2015. Retrieved 24 January 2015.